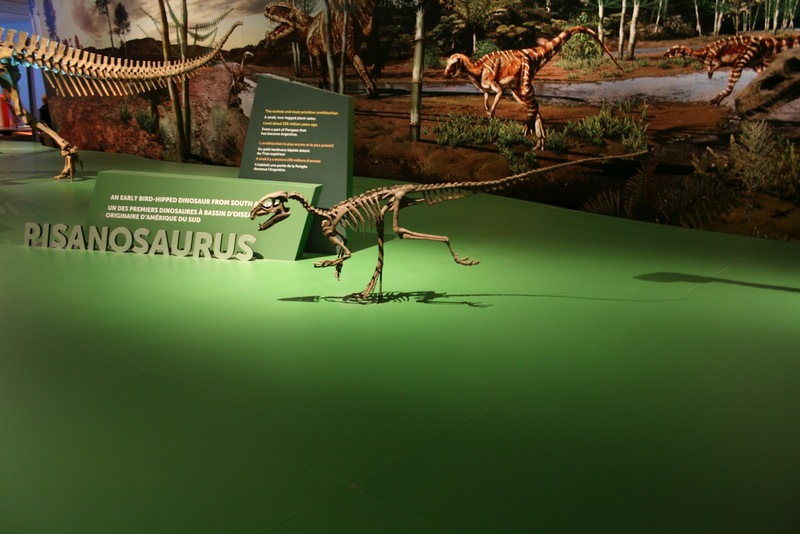 This summer, the Royal Ontario Museum unveiled a brand-new exhibit all about the dinosaurs of Gondwana. When Pangaea rifted apart during the Triassic, it split into two continents – Laurasia, represented by the modern northern continents of North America, Europe, and Asia, and Gondwana, represented by the modern southern continents of South America, Africa, Australia, and Antarctica, plus India, Madagascar, and New Zealand. 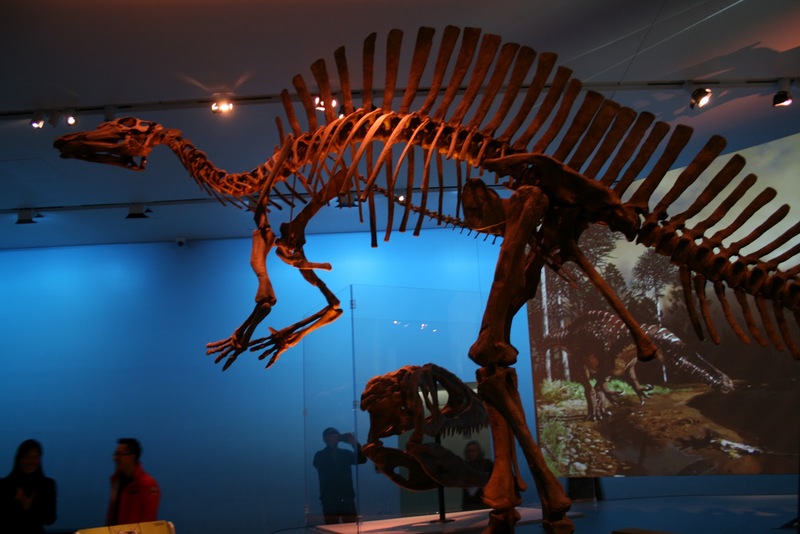 The dinosaurs and other extinct terrestrial vertebrates of Gondwana differed from their northern neighbours, and we don’t often see them in exhibitions in North America. Ultimate Dinosaurs: Giants of Gondwana features lots of interesting and sometimes obscure dinosaurs, some really great artwork, and some neat technological things (of which I am sometimes skeptical, but can wholeheartedly endorse here). After a brief but informative introduction to plate tectonics, we’re introduced to some of the earliest dinosaurs, like Herrerasaurus, Eoraptor, and the early ornithischian Pisanosaurus. In an exhibit that is definitely dominated by saurischian dinosaurs, it was neat to see this little fellow! Take note of the beautiful murals in the background, painted by Canadian palaeoartist Julius Csotonyi. Ah, Cryolophosaurus. My second favourite dinosaur from Antarctica! This restoration of Cryolophosaurus definitely seems to have a more Dilophosaurus-y look to the skull, perhaps a result of recent phylogenetic analyses recovering a close relationship between the Antarctic taxon and other early, crested theropods. As we move into the Cretaceous, the dinosaurs are arranged by geographic area on platforms. 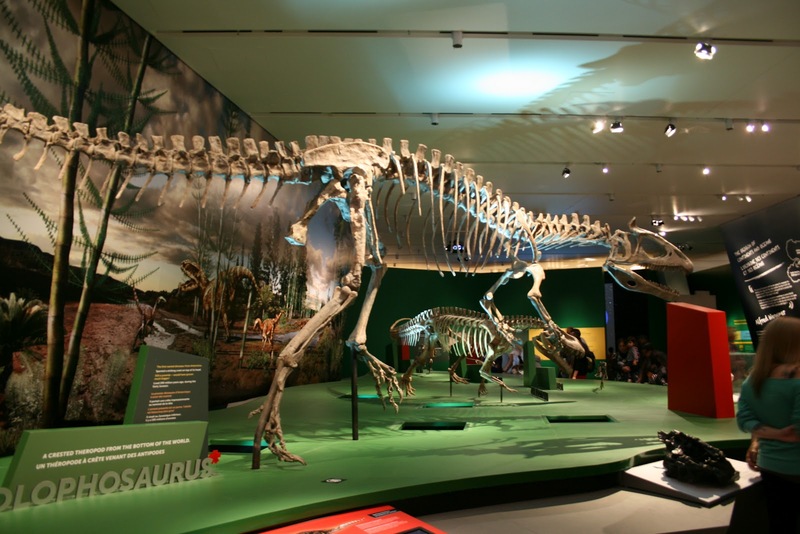 First off are African dinosaurs, including Malawisaurus, Nigersaurus, Carcharodontosaurus, and (shown here), Suchomimus. I was super excited to see a mounted skeleton of Ouranosaurus, a bizarre sail-backed iguanodontian. 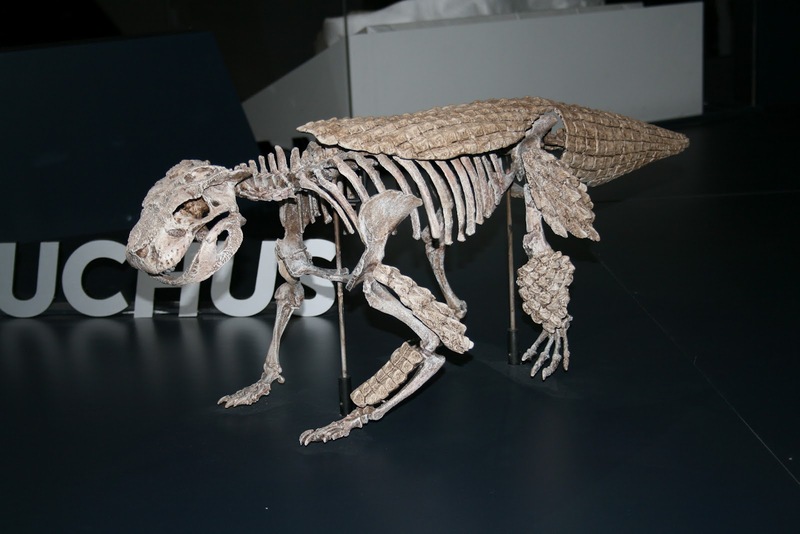 Ok, hands-down my favourite critter featured in this exhibition was one of the smaller skeletons, and not a dinosaur! I am sorry, dinosaur colleagues! But his adorable stubby tail and marvelous coat of osteoderms stole my heart. This is Simosuchus, a herbivorous crocodilian from Madagascar. I’ll perhaps also add that the Madagascar ‘pod’ of Majungasaurus, Rapetosaurus, Masiakasaurus, and Rahonavis was probably my favourite part of the exhibition, just because I’ve never seen any of these taxa as mounted skeletons before, and because they’re just so, so weird. Also, Majungasaurus just wants a hug, WHY DON’T YOU LOVE ME, RAPETOSAURUS? I was very fortunate to get to see a lot of Patagonian dinosaurs last November during my visit to Argentina, but I’d never seen Austroraptor before. He is BIG! This ‘pod’ also features Buitreraptor, Carnotaurus, and Amargasaurus. 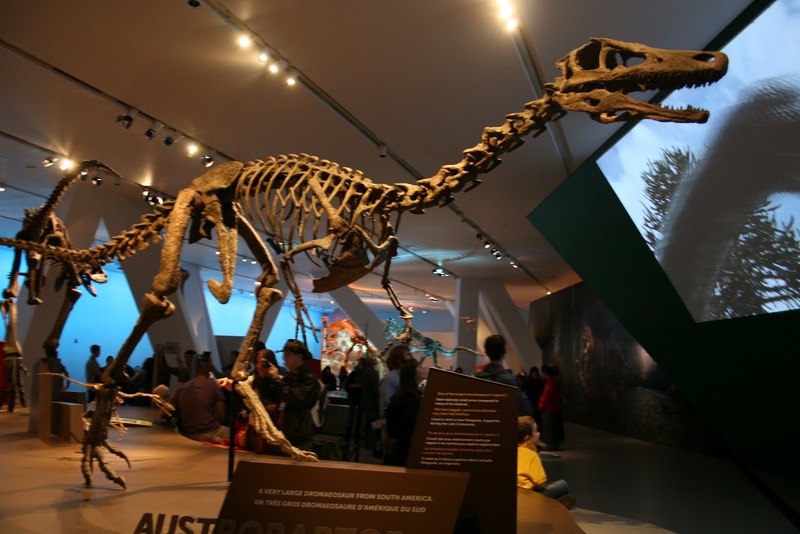 Although the dinosaurs are the main attraction, the main take-home messages of the exhibition are 1) continents move and 2) evolution happens. The dinosaurs are just the vehicle for delivering an exhibit that is actually all about the effects of plate tectonics on evolution, and I think that’s awesome. Palaeogeography is prominently featured throughout the exhibition, and there’s even an interactive team puzzle where you reassemble the continents into Gondwana. However, one of the most incredible things in the exhibit were the two giant Blakey palaeomap globes, animated to show the drifting of the continents. As you enter the exhibit, Pangaea breaks apart, and as you leave, the continents assemble into their current positions, and then keep going into the future! The video projections are staggeringly beautiful. Honestly, I think this is one of the best dinosaur exhibits I have seen. It is bright, colourful, up to date, and packed with really good information not just about dinosaurs, but about broader themes in geology and evolution as well. 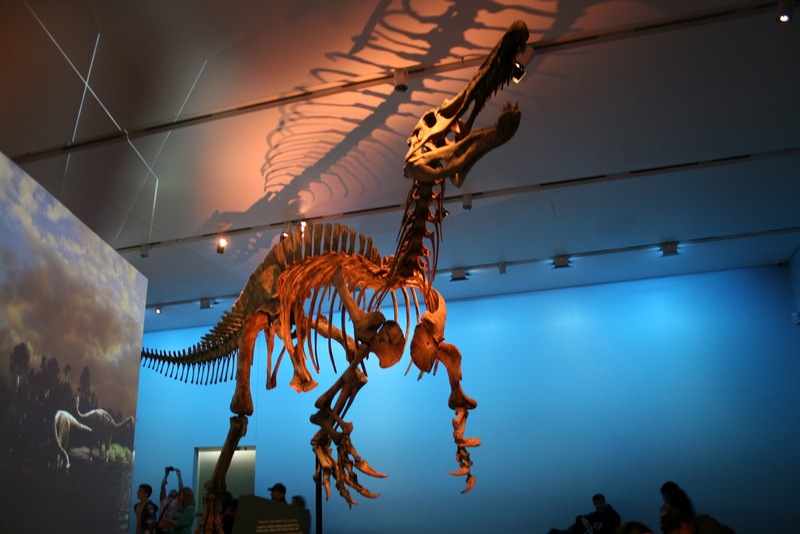 Ultimate Dinosaurs is at the ROM for a limited time (I think until the end of 2012) and then it (hopefully!) goes on tour. GO SEE IT! The Rapetosaurus looks like it's asking to be killed. 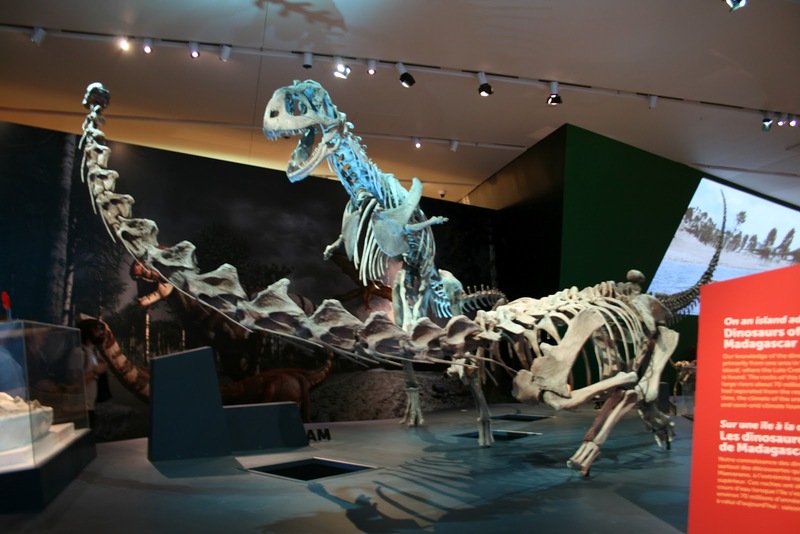 It would never let a theropod have access to the neck but position itself to use its tail.